The merging of central European scientific and practice-oriented trolleybus expertise aiming at jointly finding solutions to current challenges facing (e.g. efficient energy use, increased operation speed, corrected image of trolleybuses), is a unique approach on the European level. This process has been initiated by the Salzburg AG, which is now the lead partner of the TROLLEY project, holding the main responsibility for the smooth implementation of all activities. 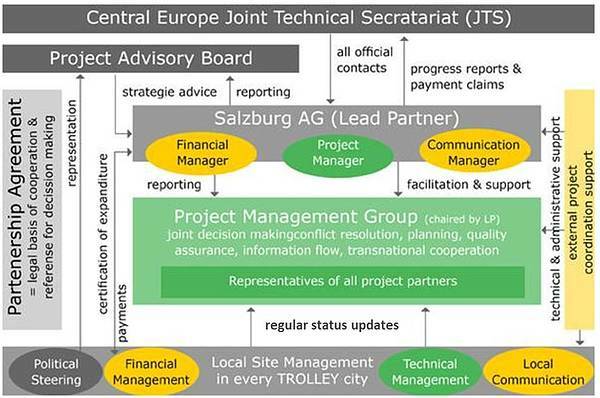 The CENTRAL EUROPE Programme's Joint Technical Secretariat (JTS) assists the Programme's decision making bodies Managing Authority, Monitoring Committee and, where appropriate, Audit Authority in programme management and programme promotion. It provides guidance to project partners and applicants, ensures sound project management and is responsible for the monitoring of project performance. The JTS is the official contact point for the lead partner Salzburg AG. The lead partner is the legal representative of the project, being soley repsonsible for a sound and timely project implementation. The lead partner (providing a financial, project and communication manager) is the main contact for the JTS and forwards all information, requests and payments to all partners. The external project manager is subcontracted by the lead partner and ensures a smooth project implementation and coordination respecting all programme rules and regulations on behalf of the lead partner. The Project Management Group (PMG) is the main decision making body of the project. It is chaired by the lead partner and consists of one representative from every project partner. It meets on a regular basis. The Local Site Management (LSM) is the local implementing body of actitivies in the partner cities. The LSM updates the PMG regularly on all relevant financial, technical, political and communication processes of the project on the local level. The Partnership Agreement is the legal basis of cooperation and reference for decision making for all partners. The project Advisory Board (AB) is the strategic advice and steering body of the project providing political, scientific and strategic recommendations to the lead partner.The AB meets every year and is composed of high level project partner representatives (i.e. executive directors, mayors) and externals.